In this fascinating study, John Haley removes the mystery surrounding misunderstood passages and supposed contradictions found in the Bible. Confusing scriptural texts are explained, and answers to the sceptics' toughest questions are answered in an understandable and straightforward manner. No longer do you need to fear situations in which family or friends challenge your faith by bringing up what they say is an obvious discrepancy in the Bible. Empowered with the insights found in this book, you can confidently and convincingly answer their questions as you share the truth of God's Word. Explore apparent doctrinal, ethical, and historical discrepancies as the author addresses issues such as mankind's relation to the present and future, the duty of man to God, and misconstrued names, dates, and places. 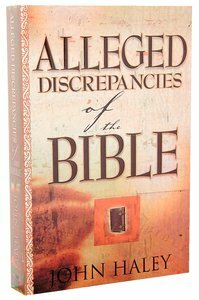 With a complete bibliographical appendix and a general topical index, Alleged Discrepancies of the Bible is sure to be a volume youll keep close at hand as you study God's Word. - Publisher In Alleged Discrepancies of the Bible, John Haley directly addresses questions surrounding common misunderstandings of Scripture. This book is essential for your personal library because it explains questionable passages, helps answer skeptics' questions, and contains valuable resource material. Haley lifts the mystery surrounding the supposed contradictions in the Bible and sheds new light on confusing passages. As you study God's Word and see His purposes unfold in your life, you will experience a new power and love for living! About "Alleged Discrepancies of the Bible"
John William Haley (1834-1927) was a late nineteenth century biblical scholar, linguist, and Christian apologist.